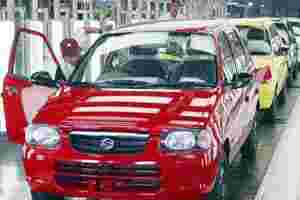 New Delhi: Maruti Suzuki, India’s dominant carmaker, may raise prices early next year to counter rising import costs due to a weakened rupee even though the near-term demand outlook remains weak, officials said on Thursday. Maruti posted an 18.5% drop in November sales from a year earlier, but this was better than in October when sales had slumped by more than half mainly due to a labour strike. “In the near term, there are stress points," Mayank Pareek, head of marketing and sales, told reporters. “In medium to long term, we are very bullish on the Indian market." He said the company, 54.2%-owned by Japan’s Suzuki Motor Corp, may raise car prices after December as a slide sharp fall in the rupee has pushed up import costs. Maruti had raised prices of its diesel cars in November. “The declining rupee and the strengthening yen mean any yen-dominated import becomes costlier," chairman R.C. Bhargava said, adding the Japanese yen had appreciated almost 28% against the rupee in a year. The rupee shed 6.7% against the US dollar in November, its worst fall in at least 16 years. Bhargava also said Maruti expected its strike-hit Manesar plant to run at full capacity by January, producing 800 cars a day, after a labour unrest this year cost it 83,000 cars or almost $500 million in lost output. Maruti, which until last year sold nearly every other car in India, faces tough competition from global car makers such as Hyundai Motor Co, Ford Motor Co, General Motors Co and Honda Motor Co and has seen its market share slide to just over 40%. The Reserve Bank of India has raised interest rates 13 times since early 2010 to control stubborn inflation and this has hit growth across sectors. Economic growth in the September quarter fell to 6.9%, the weakest pace in more than two years, and a survey released on Thursday showed factory output in November grew at its slowest in nearly three years. Maruti, may see a decline in sales volumes in the current fiscal year to March amid the weak market and as the company suffered heavy production losses due to a labour strike, Bhargava told Reuters last month. Shares in Maruti, valued at $5.4 billion, were trading 0.8% down by 03:20 pm, in a Mumbai market that was up 2.3%. The shares are down nearly a third this year, underperforming a near-20% fall in the broader market.